Differentiation in education means to change curriculum to meet the needs of a particular child. In everyday words, we call it tweaking curriculum. I believe this approach should be used by every homeschooling family, but especially for children with advanced learning abilities, often referred to as gifted and talented children (GT). Many GT children develop an insatiable need to learn. When they find a topic of interest, they enmesh themselves in it until they have learned all there is to know about the subject. While this a great trait and should be encouraged, we as parents must be mindful of the total instruction in our homeschool. Unit studies are ideal for allowing GT children a chance to explore until their minds are content. In our homeschool we use The Mystery of History (MOH) which presents a chronological and biblical history. 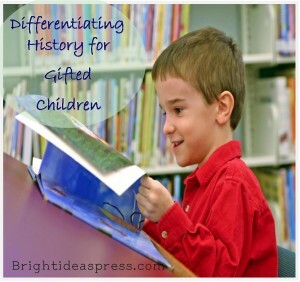 The way that I differentiate, or tweak, this curriculum for my gifted son is to slow down the schedule and use unit studies for each era of history. I align our Bible study, geography, literature, and art studies. Wherever possible, I include language and vocabulary as well. Illuminations provides our literature plans which coincide with our MOH studies. Doing this type of immersion learning means that we do not follow the suggested MOH lesson plans or the entire Illuminations lesson plans. The Mystery of History text is written in such a way that a beginning student in the first grade will complete volumes 1 – 4 three times in their academic studies, each time approaching the content at a higher level of learning and ability. For our academy, we will thoroughly explore each volume one time. This particular unit study took us about five months. Gifted students are able to learn at a faster rate and process more information. So you can see that by slowing down the progression of a curriculum and extending the areas of learning to incorporate as many subjects as possible and as in-depth as possible, the student is given freedom to explore at a pace he is comfortable with whil fulfilling the desire to know more.